EverPanel is a unique, patent pending, modular wall panel system that allows you to quickly and economically divide spaces, create rooms, and define areas. Create demountable walls, rooms, and dividers for offices and residential spaces, or use EverPanel to build portable backdrops, trade show booths, exhibits, retail displays, art display walls, theatrical or film sets or event dividers. The EverPanel instant wall system is flexible, allowing you to build all types of floor plans. Quickly build offices, bedrooms, conference rooms, or any other space required, using a series of lightweight, durable panels that connect with adjacent panels using a proprietary lug and connector system. Different size and shaped panels can be combined and connected to build permanent or temporary walls that meet a space’s specific needs. Colored accents can be added for dramatic effect and to delineate areas and provide architectural interest. You can even adhere standard adhesive backed wallpaper to your walls, to customize your room and add specialized patterns and custom colors. 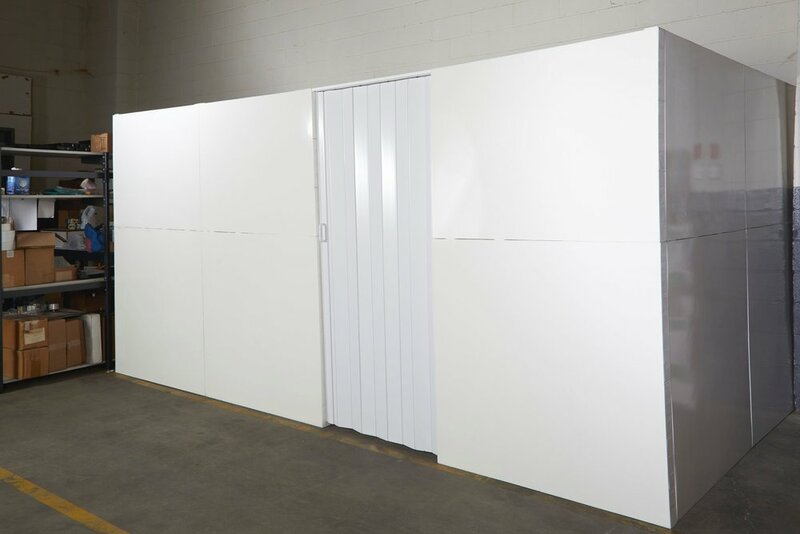 Install EverPanel modular walls permanently or use for temporary room dividers, demountable modular offices, or single use event applications. Beautify and enhance your space, while creating rooms and dividers that can be reconfigured as needed. EverPanel utilizes a proprietary connection system that allows sections to be connected to each other without tools. At the heart of the system is a series of two-way lug connectors that connect panels horizontally and vertically. A lateral connector helps lock panels together allowing for complete flexibility in design. Unlike pressurized walls, EverPanel is self-supporting and self-standing and does not need to be connected to a permanent wall. Each EverPanel consists of two rigid fiberglass composite panels, adhered to a unique interior frame system, forming a lightweight, yet structural panel. The specialized frame components contain a series of structural support ribs that provide tremendous strength and durability. Lugs are inserted into friction receiver holes that are positioned around the entire perimeter of every panel. Adjacent panels are slid into position and lug connectors are inserted into receivers in both panels, thus locking them together. Additional panel connectors are inserted at the top (and sometimes bottom) of adjacent panels to provide additional stability and to prevent accidental separation of panels. Finishing caps are inserted in unused and exposed perimeter holes, thus providing a more finished look. EverPanel walls can be dismantled, moved to another location, re-built and reconfigured as your needs change. Use EverPanel to quickly create freestanding walls to divide work and residential spaces, create rooms for bedrooms or offices and to delineate and divide spaces. Customize the layout and configuration of your walls by alternating, rotating and stacking panels as needed. Add doors, window openings and columns as necessary to achieve your design objective. EverPanel allows you to run nearly any size power or networking cables inside panels and to the location it is required. Cables can be run in any direction and through any number of panels. Plumbing pipe, up to 1.75” in diameter can also be run inside EverPanel sections. 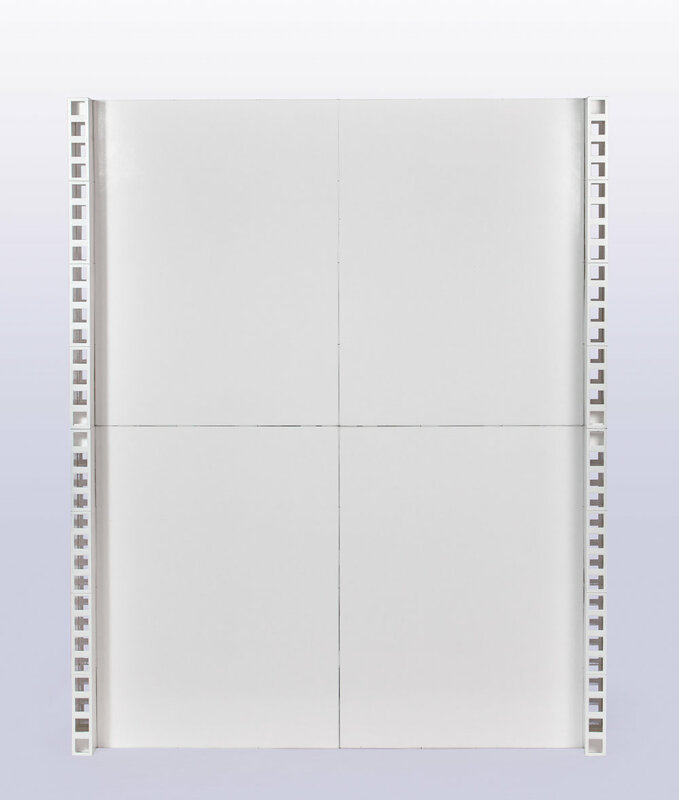 EverPanel offers finishing caps that can be inserted into visible openings on exposed wall edges or the top of wall sections. Simply insert EverPanel’s specially sized Fnishing Cap as needed to create a smooth and consistent top surface. Add the EverPanel Accordion Door or incorporate an EverPanel Lintel to create window openings or doorways. You can also frame out doorways and window openings using traditional building techniques, allowing you to utilize standard 3rd party doors and windows with your EverPanel construction. EverPanel portable walls are designed to be re-useable and re-configurable. Imagine building temporary offices as needed or permanent walls as your company grows. Install modular offices or conference rooms for visiting employees. Divide an apartment to create a bedroom for a visiting relative or for an apartment share. The possibilities are endless, making EverPanel ideal for office and residential use, special event and retail use, and exhibition and display use. When not in use, EverPanel sections store compactly and stack neatly for later use. Easily clean wall panels using standard household cleaning products. EverPanel has been tested to both E84 and the more modern E648 (Corner Test), which are the most widely accepted tests for interior walls in residential and commercial construction. The EverPanel system has passed both tests, making them some of the only modular panels that meet the most rigorous municipal building codes. In order to meet E84 and E648 a product must meet rigid flame spread and smoke tests and undergo supervised testing by accredited laboratories. View the actual test reports HERE. EverPanel modular wall panels integrate seamlessly with our EverBlock modular building blocks, allowing the ultimate in design flexibility. The EverBlock building block comes in 16 standard colors and 5 block sizes that can be mixed and matched with EverPanel to create unique designs and configurations. Blocks can be placed on top of panels and vice-versa, allowing an added level of customization and detail. Add colorful trim or other interesting elements to standard walls, integrate furniture and shelving, incorporate unique architectural elements and play with color and shape in new innovative ways. When a more finished look is required, simply add any standard adhesive backed wallpaper. EverPanel is designed to receive peel-and-stick wallpaper from various third-party manufacturers, allowing you to create truly customized looks - adding color, texture, and patterns to enhance your space. For residential and office installations where a pop of color is desired or where a existing finishes are already in place, you can choose from hundreds of options available online and in stores all over. Want to change the look of your wall? Simply remove the wallpaper and replace with another option at a later date. EverPanel is water resistant, meaning it can handle moist or wet environments and may be used indoors or outside as needed. Imagine quickly delineating spaces for outdoor events, creating backdrops for outdoor festivals and fairs or building outdoor retail kiosks in minutes. EverPanel is durable and weather resistant and may be submerged in water. When properly stabilized, EverPanel is suitable for all types of climates and conditions. EverPanel is compatible and connects with EverBlock’s EverBase flooring system, allowing you to build entire free-standing structures, complete with flooring. When connected with EverBase flooring, panels gain additional stability and strength and can’t be nudged or otherwise shifted. EverBase flooring features cable channels that allow you to run power and networking cables under the floor and to the desired location. The EverBase flooring is an ideal complement to EverPanel walls when building complete basement installations.